In the wake of a school shooting last Friday morning that left 26 students and staff dead at Sandy Hook Elementary School in Newtown, Ct., the safety of schools in the United States is once again weighing heavily on the minds of parents and school officials. The Blaine County School District in a news release issued late Friday afternoon stated that it had received “many calls from concerned parents” regarding the safety of schools in Blaine County. However, district Communications Director Heather Crocker reported Monday that the news release, which informed district patrons of the numerous security improvements that have been implemented in the district over the past few years, seemed to alleviate those concerns. Several parents contacted by the Idaho Mountain Express on Monday acknowledged that the Sandy Hook Elementary tragedy was on their minds but said they were satisfied with recent school security improvements implemented here and that they were not concerned about sending their children back to school this week. “Not even a little bit,” said Hailey attorney Douglas Nelson, who has a third-grade daughter enrolled at Hailey Elementary School and a sixth-grade son at Wood River Middle School. “I’ve been in those schools lots of times and I think they’re doing a good job with security at those schools. “If you were concerned about sending your kids to school today, you’ll probably never want your kids to go to college or ride in an airplane or anything. 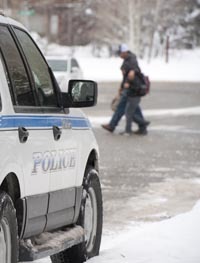 School is one of the safest places for kids to be and the drive to school is more dangerous. You can’t live your life that way or you’ll go completely insane. Hailey resident Lori Hansen, who has daughters enrolled at the middle school and at Wood River High School, said she wasn’t overly concerned about sending her daughters back to school. However, Hansen said the School District should consider locking all exterior doors to make it even harder for someone bent on violence to gain access. School District Trustee Paul Bates, who has an 11th-grade son at Wood River High School, said he hadn’t received any calls from concerned parents following the Connecticut shooting. “I haven’t felt that people were unreasonably concerned,” Bates said Monday, adding that the public seems to be mainly aware of recent security improvements in the district. Bates, who in the past has been critical of alarmist attitudes toward school security, said he thinks the School District has taken a prudent course in improving security. Hailey resident Travis Jones, who has second- and fourth-grade sons at Hailey Elementary School, works for Advocates for Survivors of Domestic Violence & Sexual Assault and is frequently at district schools for various training programs. “I feel like our kids are safe in our schools,” Jones said. “I know that’s something that’s of paramount concern to principals and to the School District.